Memories by AmyInKy: Did I miss Christmas??? 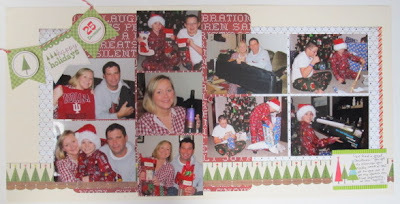 I guess when you stop blogging over the holidays, you forget to share Christmas! We actually had a wonderful holiday at home. It was perfect. 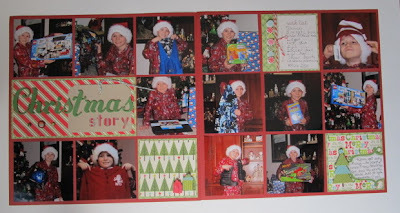 The boys were up at 6 a.m. to open gifts! The first gifts we opened were the family gifts. Everyone was happy... I scrapped Kevin's Christmas. He got a lot of good gifts! Had to include the whole family in his album, too. 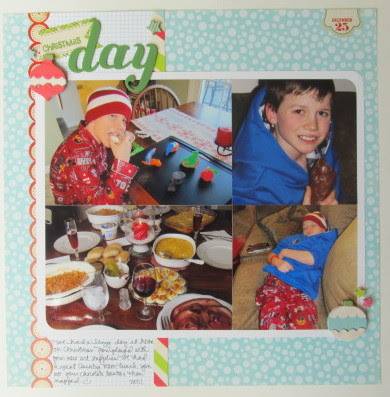 While I prepared Christmas dinner, Kevin played with his new art supplies and ate his chocolate Santa. After lunch, he took a nap. I think we all did! Thanks to Noel Mignon's December kit, I have Kevin's 2011 Christmas all scrapped. These are some great memories we wouldn't want to forget! You go girl! 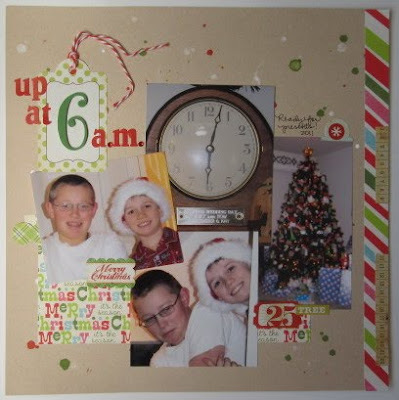 I always have a hard time scrapping Christmas pics. Up at 6am? I only wish Gabe would sleep until 6am on Christmas! We're always up at four something and then back to bed and a nap later! Wonderful to see how your Christmas 2011 is already scrapped. I am quite a few Christmasses behind.